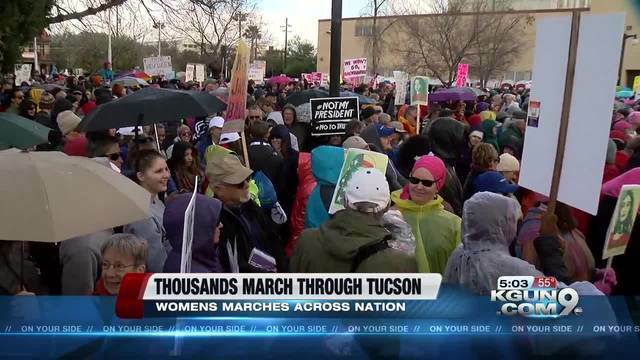 Thousands of people packed Armory Park for The Women's March in Tucson/Tucson Solidarity Rally Saturday morning. "This unique event is the product of volunteer Tucsonans working together to include community leaders, from citizen activists to Congressman Raul Grijalva and Tucson Mayor Jonathan Rothschild. This unique event is the product of volunteer Tucsonans working together to include community leaders, from citizen activists to Congressman Raul Grijalva and Tucson Mayor Jonathan Rothschild," organizers wrote in a news release. Speakers at the library included Congressman Raul Grijalva, Councilor Regina Romero, Pima County Supervisor Richard Elias and Lynn Hourani from the Islamic Center of Tucson. 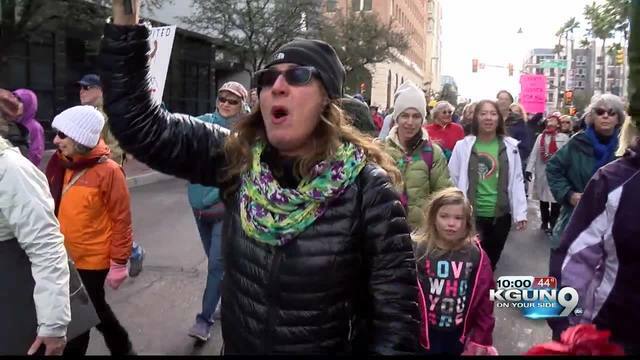 The half-mile march began at Armory Park, located at 221 South Sixth, at 11:30 a.m.
Organizers say the march proceeded peacefully to the Joel D. Valdez Library Plaza at 101 North Stone Avenue. The rally concluded by 3 p.m.
"We invite our community to this friendly and peaceful event. Please join thousands of marchers and participants from all communities of Southern Arizona," said Tim Lennon, co-organizer in a news release. "Participating with others demonstrates our commitment to human rights, equality and respect for all. When one part of our community is threatened or when parts of our community face challenges, we all stand together, we face them together. Join us for a day of inspiration and celebration."